For as long as I can remember, neutral service vehicles in cycle races have been part of the fabric of the sport. Going back many many years, I remember the yellow car of Tony Asplin being a regular at races along with others. Having experienced drivers and mechanics providing neutral service is crucial for riders and these days, none are more experienced than those in the Brother UK/Canyon UK sponsored vehicles headed up by Tony Barry with over 20 years experience. 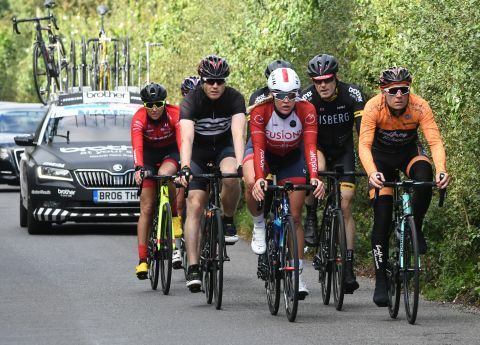 With the motto of the Brother UK company being “At Your Side” it is perhaps one of the most fitting descriptions for the service that Tony and his team provide for riders in major British races and sportives. 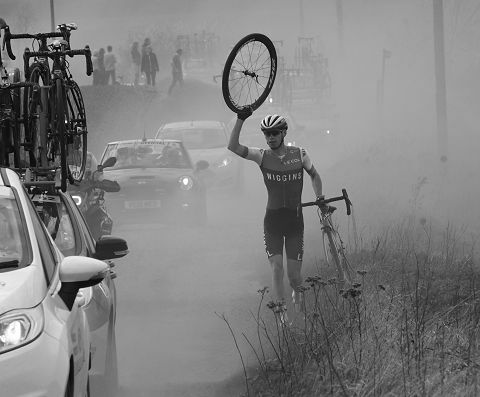 For those of you who have experienced having a tyre go flat in a race, having the Brother UK neutral service cars with their volunteer drivers and mechanics there to help out is quite simply key to keeping a rider in the race. These vehicles, with Canyon Ultimate SL bikes on the roof, cover over 20 events a year and when asked what is the busiest race of the season for them, unsurprisingly it was the CiCLE Classic. The service they provide is more than just putting a wheel in a rider’s bike or in some cases, putting them on a Canyon Ultimate race bike. At the Stockton GP road race this year, there was more required of the neutral service crews. “In the Stockton race, there were two crashes this year and luckily for us, we have a first aider in each car and when we came to the second crash, one of the riders was really in a mess there and it was more shock. A week later when I phoned him, he was okay and riding his bike but at the time in the race, he thought he had a broken leg and all sorts. Thankfully there were no major injuries that day”. Another race they were busy at was at Leicester Castle where they had 12 punctures to deal with. “I don’t know why there were so many that day” says Tony, adding it’s never been like that before and because it is a barriered circuit, that also presents challenges for them. Side of the Road: So what side of the road should a rider stand on when they puncture? “The left hand side always in this country” says Tony. “This is because the mechanic goes out the left side of the car. If he was going out the other side, he’d be stepping into the race convoy. The driver in a race convoy should not get out of the car because race vehicles will be coming up that side of you”. Neutral Service Wheels: “We run with 11 speed. None of them are disc brakes and we also have a few wheels with Junior gearing cassettes (14 up). The worst thing for us would be for us to put a 12 up into a Junior’s bike and then for them to be DQ’d. Tyres on Neutral Service Wheels: Tony says they are using 25mm tyres these days. Over the years I have seen riders on 19mm tyres and most common has been 23mm but now you rarely see that as they are generally all on 25mm and I have seen some on 28mm. 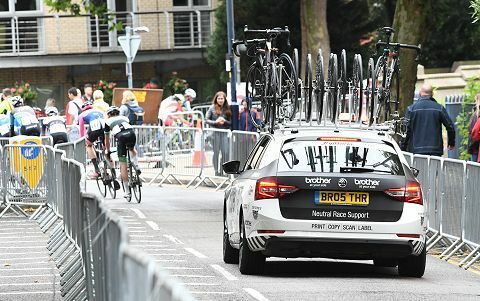 To find out more on the Brother UK Neutral Service cars, there is a very in-depth article here on the Brother Cycling page.